............. a forlorn calf appears at a loss, a misplaced cow lurks behind. 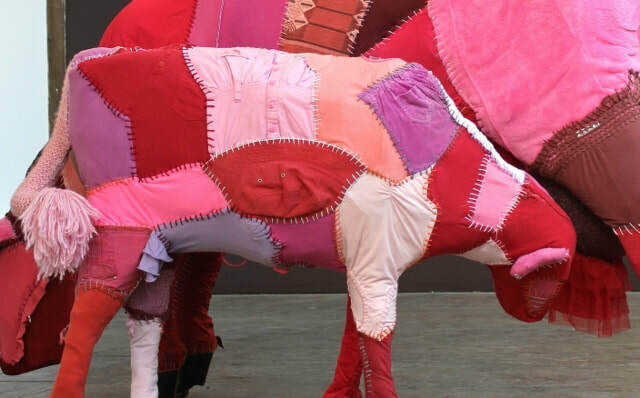 'More than a Mammory' explores the intersection between human economy and animal ecology. More than a Mammory is a textile-based installation, featuring two and three-dimensional sculptures made from pre-loved clothing. The exhibition runs for three weeks from Thursday November 23rd until Friday December 15th at Exhibit B gallery located within the Bendigo Bank Central in Bendigo. The court is open to the public Monday to Friday 7:30am - 6:30pm and Saturday 8:30am - 4:30pm. The exhibition can be viewed during these times via entry on Mitchell street, Bath lane or Laity lane. A mammary is a milk producing gland denoting the animal class Mammalia to which humans belong. Yet humans are the only species that draw upon and manipulate other animals as a source of milk, as well as meat and clothing. I think as humans we take the whole process of milk, beef and leather production for granted. In general we don’t concern ourselves with the processes and outcomes for the animals, our ecology and our health. The main focus is rather on achieving economic outcomes based on detached consumption. By using clothing I aim to link the calf, hide and meat trays directly with humans and their production and manufacturing processes, consumption and lifestyle choices. The manipulation of the cow and its milk, meat and hide extends beyond satisfying basic human needs, to representing luxury, affluence and decoration. These inanimate states bear little resemblance to past sentient life. Rather, the cow has been reduced to a source of human gratification. This installation aims to make the connection between industry products and the animal itself, drawing attention to the existence of cows beyond being milkers, beef and hides, namely that, like ourselves, they are also sentient beings, mothers and children.